Always short on time? Weeknights can get pretty hectic and cooking a meal or even a snack could be tiresome. Spend less time in the kitchen and more time relaxing around the dinner table with our delicious Under 30 minute Cooks. Here's Deepa, a passionate foodie and mum, who tells us about how she fixes a low-stress yet delicious dishes quickly. 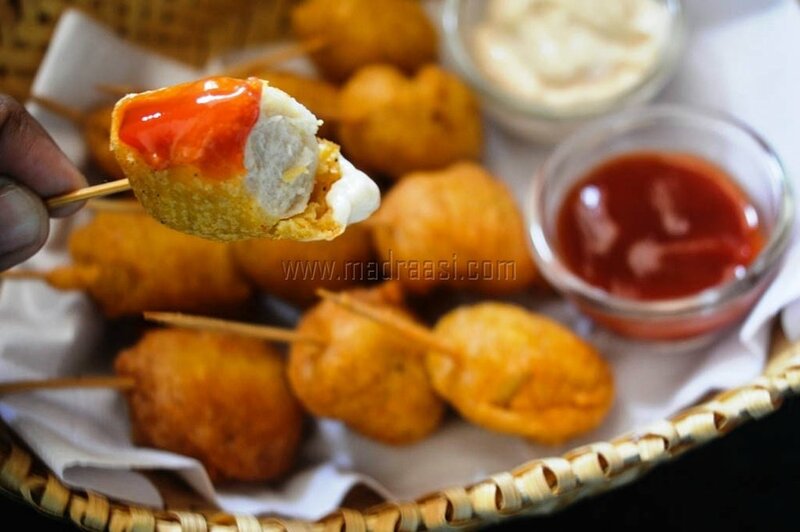 Chicken Sausage Lollipops is one of the most interesting and yummylicious dishes for after school snacks or even back to home snack. A perfect snack to munch for tea time. I was wondering what I'd prepare for my kids when they get back from school and found a packet of sausages lying in the fridge. So I thought I'd deep fry them in a batter with a toothpick inserted inside to hold and make it more comfortable for kids to munch. Voila! Chicken Sausage Lollipops to the rescue. 1.Take the corn meal, chilli powder, garam masala, black pepper powder in a bowl. Mix all these together. 2.Pour in ¼ cup of water little by little and mix them well (be sure no lumps should be formed). 3. Break in the egg and mix them well with the batter, let it rest for 5 mins (the batter should be little thick, so that it can coat the sausage). 5. Chop the sausage into four equal halves, insert a tooth pick from the bottom. 6. Gently roll the sausage in the batter, so that the sausage gets coated perfectly. 7. Gently drop it to the oil and deep fry them for 3 to 4 mins or until it turns golden brown. 8. Drain the oil and remove the sausage. 9. Serve hot with Mayonnaise and Tomato Ketchup. As my passion keeps growing along with developing recipes, I do food reviews, develop recipes for brands, work with brands for product, participate in cook-off events. Also, I have been teaching my recipes across the world through an online platform and teach cooking for kids from flameless to flame cooking. Try this delectable dish at home and tell us how it turned out. For some more exciting flavour packed meals, come over to Freshmenu today! 5 Exciting Chicken Wrap Ideas To Leave Your Mouth Watering!